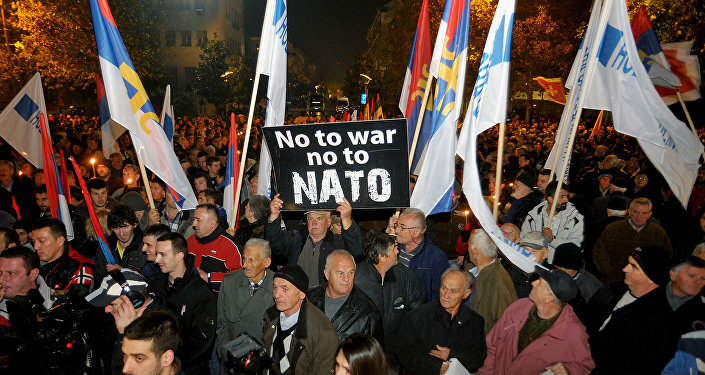 "NATO’s presence also in the Balkans is related to fighting terrorism. Because a stable Balkans is important to address the threats coming from foreign fighters. I recently visited Bosnia Herzegovina and Kosovo, and I’m encouraged to see how focused they are on countering the threat of foreign fighters," Stoltenberg declared. However, Anatoly Petrenko, a professor at the Social Management Academy, told Sputnik that NATO is merely using the fight against terrorism as a pretext in order to justify its military presence in the Balkans. "I believe that one can always find terrorists if he searches hard enough. And if there are no terrorists to be found, one can always invent them. What does the 'war against terror' entail? A certain military contingent enters a country and sets to work. Then this contingent gets expanded, a military base is built, and then this base becomes a foothold for some other plans. Hence they (NATO) need to somehow justify their presence there (on the Balkans), and so they came up with this war against terrorists or, as they put it, 'foreign fighters'," Petrenko said. He also remarked that it is hard to tell exactly which groups the NATO Secretary General was referring to as the definition 'foreign fighters' does sound rather ambiguous. "He probably was referring to terrorists, Daesh (ISIL/ISIS) members and the like when he was talking about ‘foreign fighters’. However, one can only wonder what he really meant by that," Petrenko said. It should be noted that on October 16, 2016 during the parliamentary elections in Montenegro local authorities arrested a group of people, which apparently included several Russian and Serbian nationals, who were allegedly planning to assassinate Montenegrin Prime Minister Milo Djukanovic and stage a coup. And later in February 2017 the Telegraph reported that senior sources in the UK government suspected Russian intelligence of masterminding the entire affair. Commenting on the issue, Stolgenberg said that this alleged coup attempt is in fact an argument in favor of Montenegro joining NATO, and insisted that every nation can decide "which path it wants to choose, including what kind of security arrangements they want to be part of."